One thing I hate about having different quick release tripods is having different quick release plates for each. 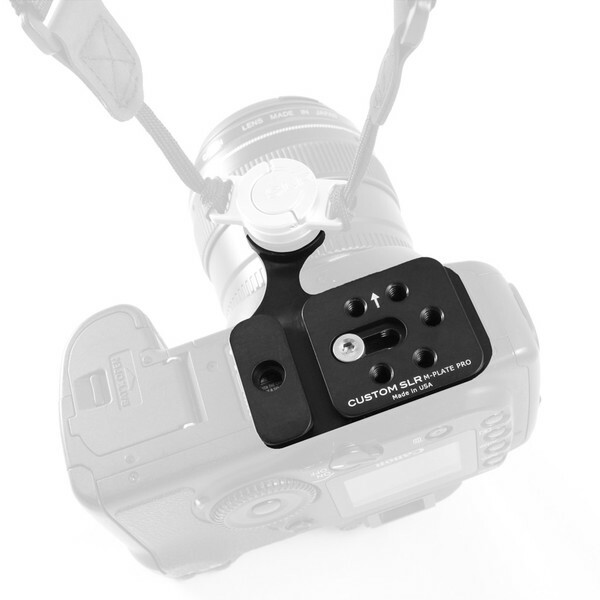 Custom SLR has solved that problem with the release of the M-Plate Universal Plate. M-Plate attaches to your camera's tripod mount. The M-Plate will allow you to connect to a wide range of tripods and includes a place to connect their C-Loop strap mount. It retails for $74.95 ($84.95 with a hand strap attachment) and is available for order now via CustomSLR.com or other online retailers. SAN JOSE, C.A., MARCH 27, 2012 — Custom SLR, a design company creating products that improve the shooting experience for photographers, has announced the immediate availability of the M-Plate universal camera tripod plate. The M-Plate is the world’s first universal tripod plate to offer built-in Manfrotto RC2 and Arca-Swiss connections as well as attachment points for accessories. Produced with appreciation from the support of more than 400 Kickstarter backers and designed by a team of seasoned photographers, the M-Plate enables quick release from any tripod head and can attach multiple camera accessories into a single plate. Crafted in the USA from aerospace grade aluminum, the M-Plate is sturdy, steady and lightweight, and works with any camera strap system including the Custom SLR C-Loop strap mount, BlackRapid, Spider Holster, Sun Sniper, Cotton Carrier and virtually any system that would typically occupy the camera tripod socket. When using the M-Plate in conjunction with the C-Loop camera strap mount, photographers will find the additional benefit of a perfectly balanced camera for increased comfort and quick access. The ergonomic design of M-Plate relocates the tripod socket making it easier to shoot portrait shots. Designed as a part of a modular system, the built-in M-Link Port™ will connect with future photo and video attachments, including flash brackets and video rigs that are currently in development. A Kickstarter first, the M-Plate is the Custom SLR team’s third project funded successfully through the crowd-funding website. The M-Plate is available starting today, March 27 for a MSRP of $74.95. Photographers can purchase the M-Plate through CustomSLR.com or through many authorized dealers worldwide. This entry was posted in Product Announcements and tagged Custom SLR, M-Plate. Bookmark the permalink. This plate looks greate will it work on the Canon EOS 5D Mark III 22.3 MP Full Frame CMOS with 1080p Full-HD Video Mode Digital SLR Camera (Body) ?